One of the largest archaeological parks in Hungary looks back on a past of more than 110 years. 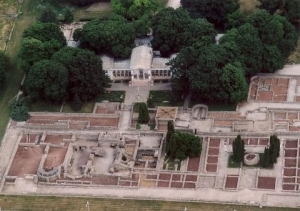 The ruins area puts on display around one quarter of the Civil Town of Aquincum with its most characteristic public buildings and dozens of private houses. These building remains recall the most important heyday of the provincial capital, the town-structure from 2nd-3rd century. Information-tablets for visitors in Hungarian and German stand beside the most important ruins. Chronoscopes installed in the park provide a glimpse into the way the buildings of the town originally appeared. Visitors can see Roman period objects from the territory of Budapest in the permanent and temporary exhibits. More traditional events in the archaelogical park help visitors come closer to the life of the Romans in Aquincum. Both adults and children can learn about Roman history and life ways in lessons provided thru the museum's education program.